Alex has been digging in the dirt since he was able to crawl. That spurred his affinity for rocks and fossils. He has never taken his job for granite and always has fun. He graduated with a B.S. 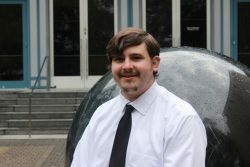 in Geology from Sam Houston State University and continues studying every day to further his knowledge in Paleontology. Jurassic Park was an inspiration to him, much like others, to study ancient life. “My job is to share my knowledge of the Earth and the life that lived on it to show people how awesome and grand it is.” He can be very gneiss, friendly and great with kids. The Houston Museum of Natural Science and the Discovery Guides are great catalysts in the solution that is learning. With Alex moving the ground beneath your feet, it will be his fault if you have a rockin’ time.